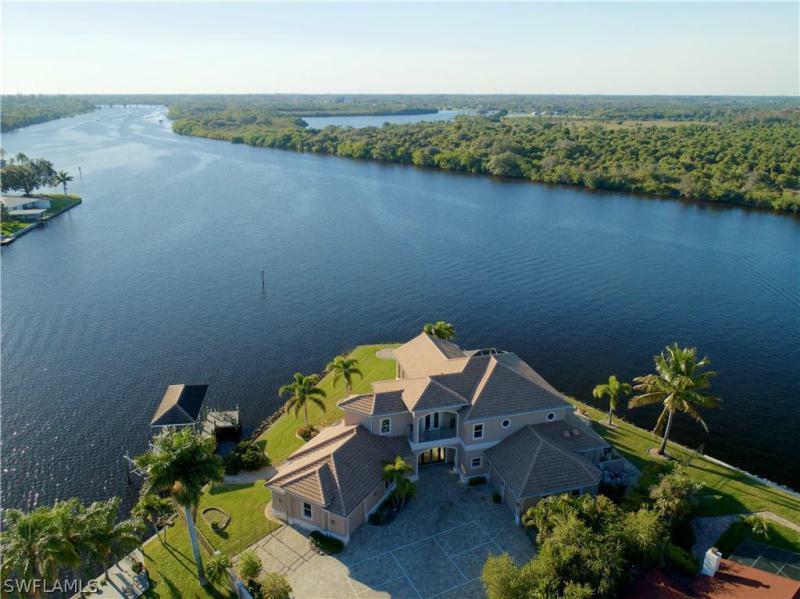 Over the top luxury and views with this exclusive southwest florida waterfront estate. A home that makes you say wow! This 3/4 bedroom home is a waterfront wonder with over 4000 living sq ft that sits on a point with over 280 ft of wrap around frontage. 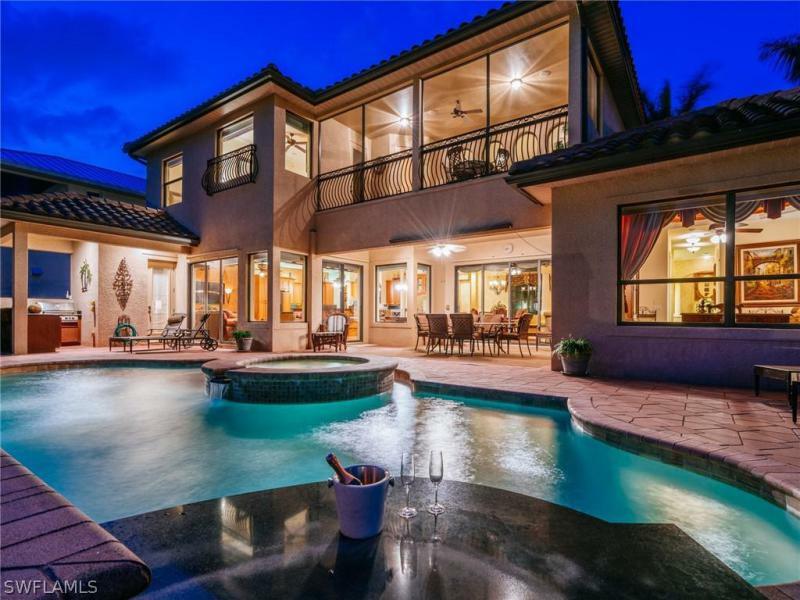 Enjoy awesome boat activity and sunset views from incredible indoor and outdoor entertainment areas, fantastic negative edge pool with spa, covered deep water boat dock with 2 lifts, a true outdoor kitchen, huge covered lanai with gas fireplace, fire pits and custom fountains. Explore a new level of luxury with features like floor to ceiling walls of glass, incredible detail/craftsmanship/concrete piling construction, great lighting, fantastic living areas, elevator, chefs kitchen, waterfront den/loft area, theater room, 3 car garage and a very generous master retreat with private observation deck and spa like bath w/custom closet areas. Fantastic lifestyle if you enjoy boating, wake boarding, tubing, skiing, jet skiing and more. This is a home with a wonderful floor plan w/views like no other! Custom built gulf access masterpiece. This beautiful home offers something for everyone. For the boater theres a custom dock, two covered boat lifts (24,000 lbs and 7,500 lbs), a new truline heavy duty vinyl sea wall with 14 solid panels and 1 rebar, fish cleaning station and no bridges to the open water. For the chef a gourmet kitchen with wolfe appliances, gas range, hidden walk-in pantry, granite, dining room, breakfast bar and large island. A large custom free-form pool and spa with heater, water feature, stream and bridge for entertaining the children. For the grandparents you have your own private elevator. The 3 bay garage even has enough room to park your full size rv inside. 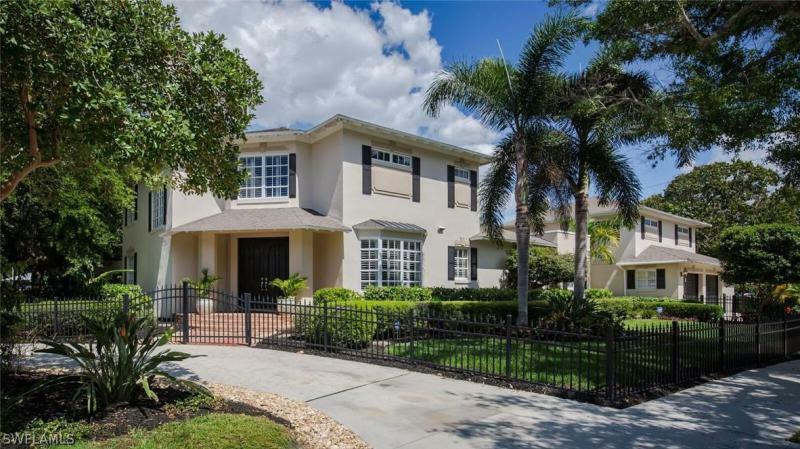 Theres not a detail that has been overlooked in this lovely 5 bedrooms, 6 bath home with den/office, loft/library, secret room, private terraces, 22 coffered ceilings, double tray ceilings with tube lighting and two story entertainment center. The outside is an entertainers dream with outdoor kitchen featuring profile stainless gas grill with double side burner, sink and storage. Two story pool screen enclosure, 2 covered areas for dining and lounging with tongue and groove pine ceilings. Boaters paradise. 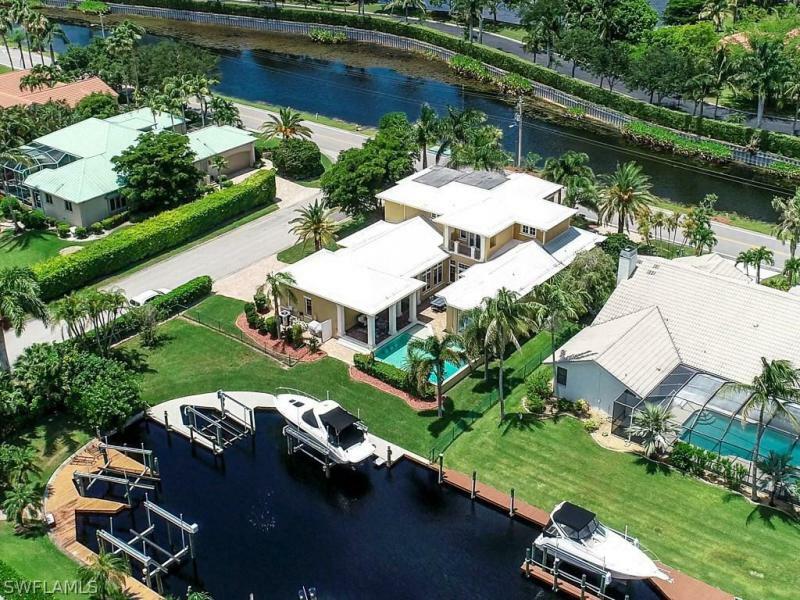 This stunning 2006 waterfront residence is exceptionally priced below appraised value. No hoa. 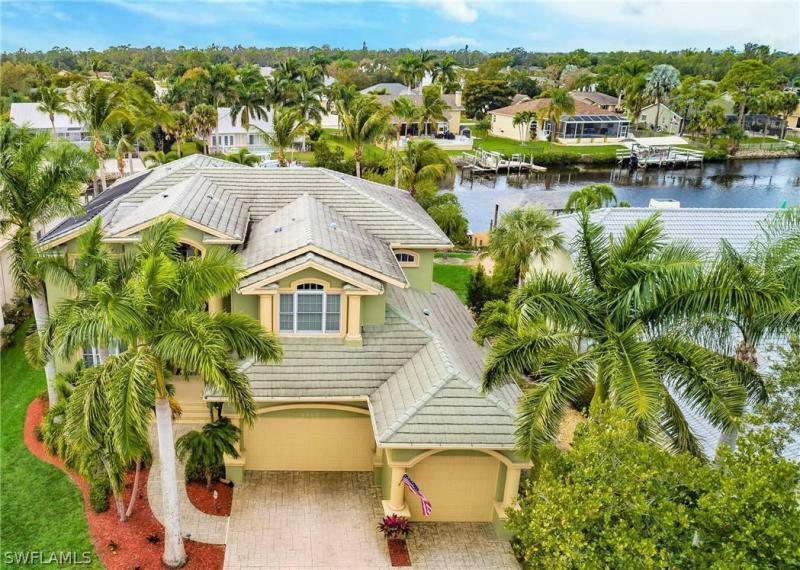 Spacious circular drive, 3 car garage, and $50,000 private dock equipped to showcase your boat on the 10,000 lb. Lift and pristine pvc decking sprawling across 100 ft of prime water frontage. An inviting outdoor space welcomes a meticulous buyer with lush tropical landscape, mature palms, a fenced yard, outdoor kitchen, and fountains illuminating your expansive water views. Enjoy the breeze from your ideal southern exposure as you watch sunset from your poolside swim-up bar or spa. Impact resistant windows, 3 zoned cooling, and new hot water heater. Luxury designer furnishings and $30,000 et package included. Lease to purchase option. Create your own custom design and style with over 3400 sqft, boasting a main floor master, & spacious loft to entertain vip guest in the game room or screened balcony. Town & river estates is defined by its coveted proximity to historic downtown, sandy beaches, & walking distance to leisure craft marinas and fine dining. Home values are further strengthened by deep water canals, & effortless accessibility to the gulf of mexico. Fabulous, west indies colonial style home is only 5 minutes to the river and 25 minutes to the gulf! This boater's dream has a dock w/ 2 lifts. 16,000 lb & 7,000 lb plus underwater fish light, water & shore power. Understated elegance w/ attention to detail best describes this two-story residence, with a first floor master suite. There is a formal living room w/gas fireplace and coffered ceiling, formal dining room, and a kitchen/family room w/ informal dining area. The gourmet kitchen has new kitchen aid appliances, sub-zero fridge, a gas cook top, wall-oven, wine fridge, walk-in pantry, roll-outs, granite and more. The large master bath has a jetted tub, walk-in shower with two heads, double sinks & vanities and separate toilet & bidet. Elevator to the 2nd floor opens to loft area den & wet bar, 2nd master suite and another ensuite guest bedroom & bath. Other highlights include solid core 8' doors, crown molding, sonos entertainment system with speakers throughout, outdoor shower, summer kitchen with new gas grill, cozy pool & spa deck with covered seating and more! You'll find uncompromising quality in this w. R. Stancel built home located in esteemed renaissance featuring an 18 hole arthur hills designed golf course, clubhouse, spa, fitness, and tennis all on 500 acres of beautifully landscaped vistas. Daily concerns melt away as you step into the tropical zen courtyard with heated lagoon pool and spa, koi pond, water features, outdoor kitchen and gas fire pit. The main home offers floor to ceiling sliders that open to the courtyard as well as to a wrap around patio that overlooks the lake and 4th fairway. Downstairs is the master suite with 3 walk in closets, spa bath, and office; & en suite guest bedroom. Upstairs you'll find a loft sitting area,kitchenette, theater room plus family room & full bath,which can easily be converted to a massive 4th bedroom,(second master suite. ) completing the ensemble is a detached cabana suite with kitchenette. So many custom details throughout - smart home technology with lutron lighting, interior & exterior cypress doors, coffered and tray ceilings with recessed lights, hurricane impact windows, river rock granite counters and marble flooring, raised panel glazed cabinets. The best value in renaissance!!!! Direct gulf access, fully renovated over 3500 sq ft under air on the water! This home has it all. Absolutely must be seen - renovated throughout to rival the newest of construction and luxury finishes! Stunning gourmet kitchen with custom cabinetry, high end appliances and generous center island with seating. No detail spared with each room exuding relaxed comfort combined with first class pure luxury. Two master suites and spa quality baths. Superior upgrades and impeccable detail, including marble flooring and custom lighting. The second floor office/loft has stunning 360 degree views of deep lagoon estates. Master bath includes his and her sinks surrounded by custom cabinetry, jetted whirlpool tub and a separate walk-in shower with three different shower heads. Gorgeous sun room adjacent to the master bedroom with full view sliders highlighting beautiful heated pool and canal providing plenty of room for entertaining. The large dock provides ample room for a variety of watercraft(s). Furnishings are negotiable too! Priced to sell today! Location,location,location,and no hoa fees!completely renovated,upscale finishes & features. Beautiful grand estate loaded with character. 4 bedrooms (could be 6) den/playroom, bonus room, 4. 5 baths,2. 5 car garage. Riverside of mcgregor rd,in the prestigious neighborhood of riverside! Accross the street is public golf! Decorative iron fenced large corner lot;impressive curb appeal. Great split floor plan for mother in law or kids wing with balcony,loft den,2 bed,1 bath attached section. High-end hardwood flooring throughout,travertine tile,granite,stainless appliances,walk-in pantry,wine bar w 3-zoned refreshment center. Plantation shutters throughout entire home. Two winding staircases and 2 real wood burning fireplaces. Lush landscaping with new lighting,irrigation and completely fenced yard. All brick courtyard with heated pool,pool bath and screened patio. Formal living & dinning,open great room kitchen/ family room concept,charming archways and crown molding throughout!zoned to all the top rated schools in fort myers,and just a golf cart or bike ride away from the new downtown river district!